Organizations allow to use foreign currencies, according to the their activity and policy. This tool of Hyper displays the rates of the allowed foreign currencies of the organization, that were defined in the system fundamentals. By using this tool, the user can display the history of the foreign currencies rates, according to the filter fields at the top of this tab. Also, the accounts manager can modify and update the currencies rates of the organization on required dates. the displayed rates were defined by the system administrator for the organization. Please note - only currencies that were defined in the System Fundamentals of Hyper, can be used by the organization. For further information about the this definition, read the read the System Admin section at the bottom of this page. In order to display the history of the currencies rates, for required dates and currencies, use the filter fields at the top of the table and click the Filter Records button. If no dates are required, the table displays the history of the currencies rates from the first use of Hyper or from the defined date in the System Fundamentals. 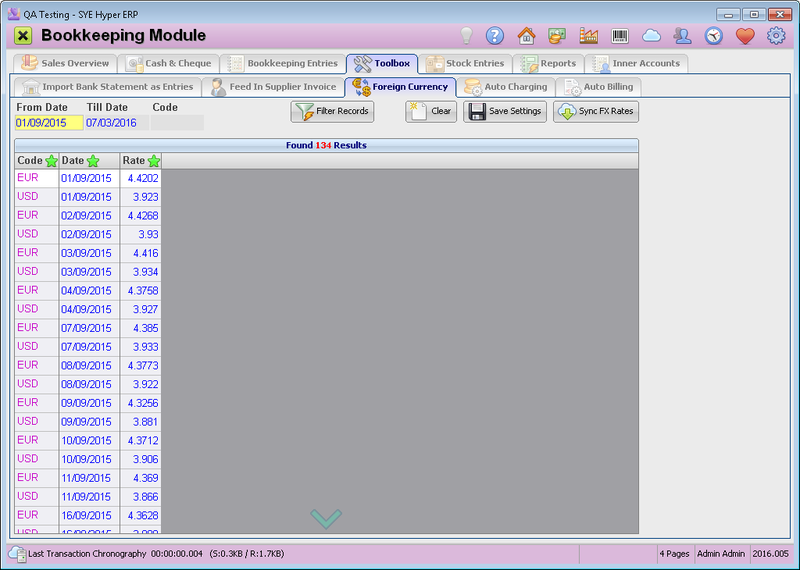 If no currency is selected, the system displays all of the allowed currencies of the organization. Use the Clear button to clear the table (this action clears the table and does not affect the currencies rates). Please Note - The displayed currencies rates are related to the bookkeeping currency, as was defined in the Sales tab of the System Fundamentals. The currency rate value will be less than 1, for stronger foreign currencies. The system allows to manually update the rates currencies. In order to update the rates, use the filter fields to display the required currency and dates. In the "Rate" field, fill in the required value and click the Save Settings button. To cancel the modification (before saving it), click the Clear button. Please Note - after saving the new currencies rates, the old rates can not be recovered by using this tool, but only from the System Fundamentals. The rates of the foreign currencies can be synced with the central bank rates, only for the date of the last rates update. use the Sync FX Rates button to sync the rates. If you wish to update the rates of the currencies with rates from other date, contact the system administrator. The currencies rates are calculated as follows: Foreign currency * Rate = Local Currency. The configuration of Hyper was designed to automatically use the local currency of the defined country of the organization. According to this data, the system selects the appropriate bank to receive the currencies rates from. If the local bank does not have any direct exchange rates for the required currencies, the system uses another bank that allows direct conversion, by using USD or EUR. For Example: if there is a need to convert ILS (Israeli Shekels) to PHP (Philippines Peso), the system will convert the ILS to EUR and then from EUR to PHP (according to the EBS Bank). http://eng.sye.co.il/kb?book=7&q=TSystem_Settings_Container.System_Settings_Frame4 The approved currencies of the organization are defined in the System Fundamentals. Open the Sales tab and add the required currencies in the Operative Currencies table. For each currency, fill in the required fields: Code, Full Name in English, Minimal Cash Coin Amount, Safe Minimal / Maximal Rate. The rates will be synced with the defined data source of the currency. The download currency rates time is defined at the top of the "Sales" tab. Please Note - The exchange rate is calculated according to the defined Bookkeeping Currency, at the top of the "Sales" tab. The exchange rate will be less than 1, if the Bookkeeping Currency is stronger than the foreign currency. The currencies rates can be recovered and updated for required dates. Open the "Sales" tab of the System Fundamentals and click the Rebuild FX Rates Table button. A new window will be displayed, where the user can define that the new rates will replace any previous manually updated rates. Please Note - The new rates will be updated according to the data source (bank).